I love Bonnie Hunter patterns and after 39 years of quilting am always trying to use up my scraps,why oh why do they just keep on piling up. Bernie, thank you for the inspiring post! I have not yet made a scrap quilt, but certainly need to due to my overflowing scrap bucket! Crumb quilts are a new concept to me and I am excited to try them out! I also plan to cut as many 2 1/2” squares as I can and make a variety of projects with those. I have made some scrappy quilts and I save everything. I don’t know if I’ll ever use them all but I hate to throw anything away! I enjoy scrappy quilts and I am working on my third Bonnie Hunter quilt now. It is fun to use up scraps and Bonnie’s designs certainly do that. This new book would be a great one to get. Love your table runner/wall hanging! I like “controlled” scrappy projects. I did one of Bonnie’s mystery quilts and learned I have a hard time with too many fabrics. I don’t save anything smaller than 1 1/2″ squares. That is too small for me! I have made Bonnie’s scrappy On Ringo Lake. I love to collect scraps, but don’t use them as often as I should! Right now, I’m putting strings in a bin to make a quilt for my youngest great niece–hopefully will get started on that soon! I am a scrap quilter. Scraps are great, and find their way into my quilts, table runners, mug rugs, pretty much anything I make. Scraps are sentimental, which makes them valuable. I love those tiny squares! Your table runner/wall hanging is awesome. I love Bonnie. She is a great teacher. So much information and instruction in her books and Mystery Quilt adventure! I’ve learned so much from her in the last three years. Scrappy is the only way to go if you ask me. I’ve followed Bonnie for years and have introduced her method and books to several of my quilting friends. The best thing about scrap quilting is that I seem to have a never ending supply! Bernie, That’s beautiful in purple colors. I love string quilts. If only there were more time in the day!!! Hi Bernie, I’m still a relatively new quilter and I tend to go for the controlled scrappy look! My introduction into quilting was Jenny Doan so my stash is all pre-cuts! I make small projects mostly and tend to use up all the fabric from a project — I do save strings because I love string quilts! I have used a couple of Bonnie Hunter’s patterns and I love her videos — she’s a super inspiration! I love your table runner — the colors are awesome! Like you, my scrap bins are overflowing, so I need to make a scrappy project. 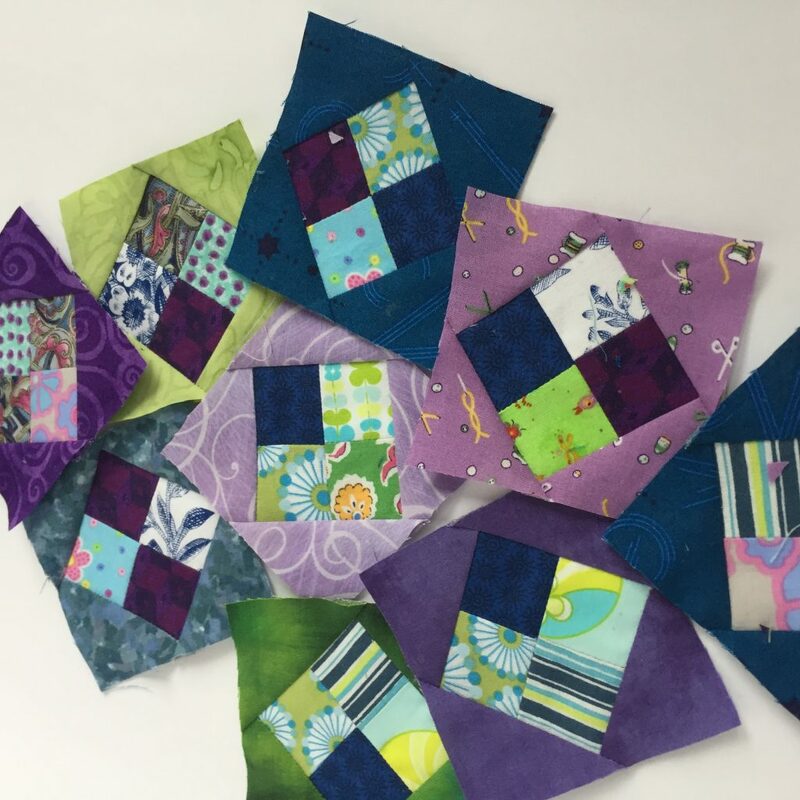 Your blocks turned out so pretty with those colors, and your FMQ is just perfect! Hi Bernie, I am a scrap quilter and like you if I like a pattern I usually try it in a smaller version. My favorite size is a lap quilt. So many uses and everyone that visits can grab a lap quilt on a chilly winter evening. I recently made a little mini with bonus half square triangles. The little squares are 1 1/2″ unfinished, so I use lots of tiny pieces. My favorite color to use is purple so I really like the three colors you chose for your runner. I FMQ also and try out new designs on my smaller projects as well. Hi Bernie! While I have yet to make a scrappy quilt, your mention of hanging your table runner has inspired me; I have been eyeing a blank wall in my sewing room, aimlessly looking for what to put there, and now! What better for a sewing room. I also must admit I’ve never made anything but quilts, never a table runner, nary a pot holder. The closest I’ve come to using quilting methods was a cute pin cushion for my sister. I wish I had a picture of it as she still uses it! Thanks for sharing this book, as another great idea as a gift to my sister. She and I both have tons of scraps lying around and haven’t put them to use. And yes, I save even one inch strips and if I can cut it still, I save it. Tiny blocks seem daunting, recall I hate the cutting part lol but I think I’ll try your runner idea. Lo e the 4 patches. Got lots of 2.5″ squires for your chosen project. I am more drawn to controlled scrappy looks. If it hasn’t one color in the setting design, I like it better. I love you table runner. Great colors!! I love your tablerunner, Bernie! That was a great idea for giving one of Bonnie’s patterns a try. I like the purple in it, and those little 4 patches are so fun. I have that book, and now I’m going to have to dig into it a little more. Thanks for the idea! I love scrappy quilts and pieced backs. I’m currently doing Bonnie’s Jewel Box Star leader and render challenge. 2” square is about the smallest I go except in strips. I also still cut 5” charms and 2.5” and 3.5” squares. And 2.5” strips too. I love scrappy. I’d love to win!!! Years ago, Bonnie Hunter came to our quilt guild and taught a class. I was introduced to a way to deal with the scraps left over from my previous quilts. And I loved it! I am an organized person by nature and “controlled scraps” appealed to me. But the strings, the only thing controlled about them are they are somewhat folded up and in liquor boxes that I found for free. Neutrals are in one box and the other colors are in many boxes. And the thing about strings is that they reproduce and grow in abundance! I can’t sew them fast enough. I foundation piece them into blocks, but I like the ideas I see in Bonnie’s new book String Frenzy. More possibilities for my growing strings! I’ve been saving scraps just because. Some I’ll use for collage quilting and the others…well, seeing Bonnie’s crumb quilts and string quilts has given me another purpose! I’ve really not done any scrappy quilting but I predict that will change! I love Bonnie’s philosophy about making scrap quilts! Great table runner!! Your colors are “happy”!! Some of my quilting friends think I’m a bit “nuts” when I ask them for their scraps and “crumbs” and just shake their heads! Besides the scrap quilts and hangings, I have made terrific little coasters, fabric boxes, small bags and pin cushions from those tiny pieces. LOL many of those friends that make faces when they give me their scraps do like to receive them as gifts! Some quilters can’t be bothered to “freestyle” with these small gems of fabric but to me it’s Play Time! Oh, you should definitely hang this one up! Then you can see it in its full glory every day. Great pattern, and I love the cool colors. Scrappy and string quilts are my main thing now. I have made many and have many more to go. I love selvage quilts, too. i have made several of bonnie’s quilts…will need to check out her new book. i save anything an inch or more. i have been known to throw things away….then dig them back out of the basket and save them. i can make a dozen quilts from my scrap piles….and a dozen more from the selvage boxes. i can’t seem to use them all up, although the yellow selvage box is relatively empty …. there are just about a dozen pieces in there. Beautiful Scrappy Daybreak runner! It will be beautiful on the wall, makes me want one too. I use Bonnie’s scrap user system as well as colorizing my strips and strings. I keep anything 1 1/2″ or bigger for blocks and 1″ or bigger for strips and strings. So much fun! I do scrappy quilt but always seem to generate more scraps than I use up! I LOVE scrap quilts! I have been following Bonnie for a few years, and love all her designs. I always sew all my scraps together to make “new” yardage, and then use that for whatever I am working on. Anything more than 1/2 inch is fair game. I have made quite a few of Bonnie’s patterns – 1 is on my bed now. The smallest scrap I save is 1 1/2″. Anything smaller that that goes in a bag for a friend who is making a string quilt. Scraps are the best! I found Bonnie a few years ago and have enjoyed doing her mystery quilts. Love doing scrappy quilts. I love your table runner. I make a lot of scrappy quilts but tend to control the colors like you did. I do like scrappy quilts and especially Bonnie Hunter’s. I love the look when so many fabrics combine. I love scrap quilts and save most everything!! Wish I had more time to sew, work gets in the way!! lol! 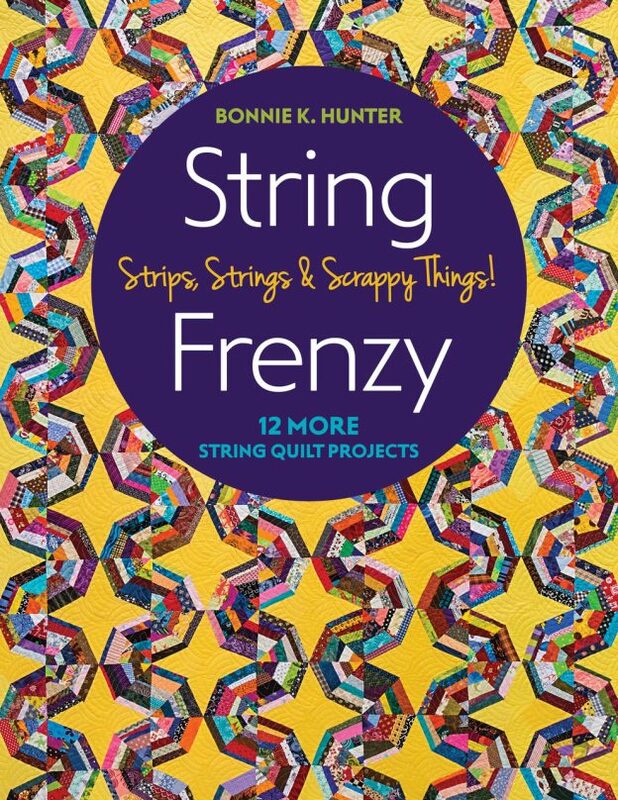 Would love a copy of String Frenzy, can’t wait to more of Bonnie’s patterns! Thanks for the giveaway. Maybe you could do both with the runner you made, on the table for awhile and then hang it up. It has perfect colors for Easter/spring. Your wall hanging/table runner is lovely! I am indeed a scrappy quilter. Would I save a 1-1/2″ piece? Of course! I have a log cabin quilt made with 1″ pieces and one with 1-1/4″ pieces. I love making log cabin quilts and when I cut scraps I cut the sizes for these to make more, unless my string box needs replenishing with anything over 1/2″! I took one of Bonnie ‘s classes last fall. It totally changed my way of thinking. I had been a let’s buy a kit type of person til then. Now I’m scrappy all the way. And I keep any thing bigger than 3/4 inch. I love scrap quilts, and yes I would save a 1.5 inch square! I am making Bonnie’s Wild n Goosey pattern, so small pieces work. I am a scrappy quilter! I love the rich and busy look, and have inherited quite a bit of fabrics from my mother and mother-in-law. I think of them whenever I use their fabrics or quilts with their fabric in them. Thank you for the opportunity to win Bonnie’s book! Scrappy quilts are my absolute favorite to make. I get bored with matchy matchy! What a cute project! I love scrappy quilts, and save my scraps, down to 1″ to make something. So far I’m collecting scraps and ideas. It’s fun to dream! Thanks for the chance to win Bonnie’s book. My first totally scrappy quilt, Bonnie Hunter’s Good Fortune Mystery Quilt, is still in the works. I’m a recent scrappy quilter but will now save scraps as small as 3/4″. Being able to use little pieces in strip sets was a real eye-opener for me! Love your table runner! I am a scrap sewer and saver, saving as small as an inch. Bonnie’s quilts are absolutely amazing and I would love to try to make one. I do love scrappy quilts! The smallest pieces I save are 1.5″ squares, but strings can be a bit narrower. Love Bonnie’s patterns for all things scrappy! I love scrappy quilts and that is about all I make. The smallest square I save is 2″, but I keep strings that are 1″ or more wide. I like to make crumb quilts as well. Your table runner/wallhanging is wonderful! Great table runner/wallhanging – I am looking for new inspiration about how to use all my collected scraps! I have them sorted by color, but want to use them! I’d love a copy of this book for inspiration! I love scrap quilts and Bonnie’s designs and directions are the best! Scraps need to be pretty small not to be saved for something, about and inch or so. Yes, I am a scrappy quilter. 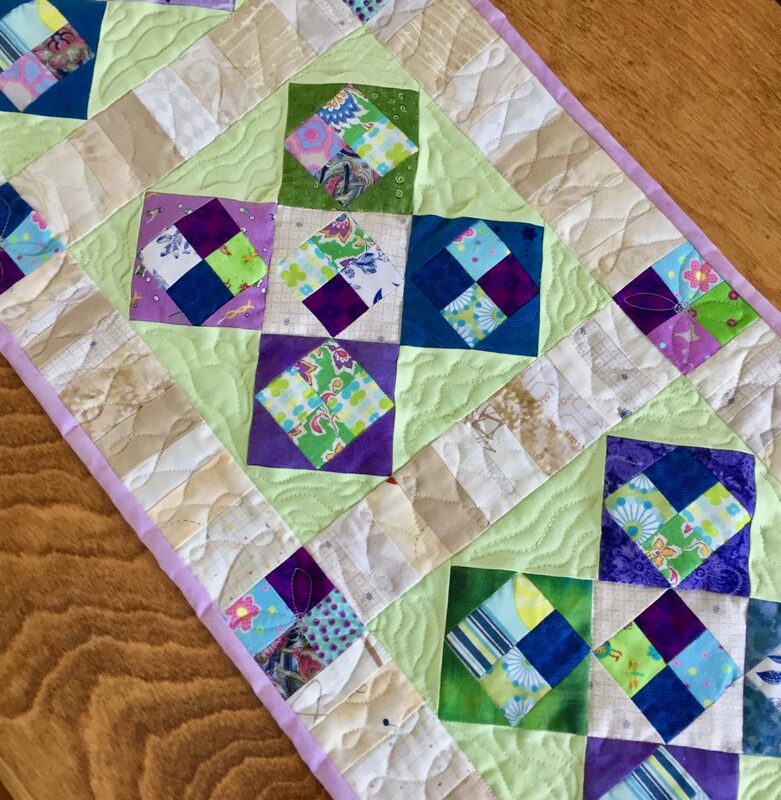 I’ve most recently been using scraps from the late Grandma’s stash – I love, love that she taught me to quilt and passed her love of all things creative on to myself and my sister. It makes my heart happy to see pieces of projects past sewn into our projects today. love scrappy quilts – i save 1.5″ sqrs – postage stamp quilt? Yes I love scrappy and yes I would save a piece that is 1 1/2 inches. I love making potholders from the smaller bits. Working on Bonnie’s “Wild and Goosey” currently! Love, love, love using my scraps and getting a beautiful finished project . 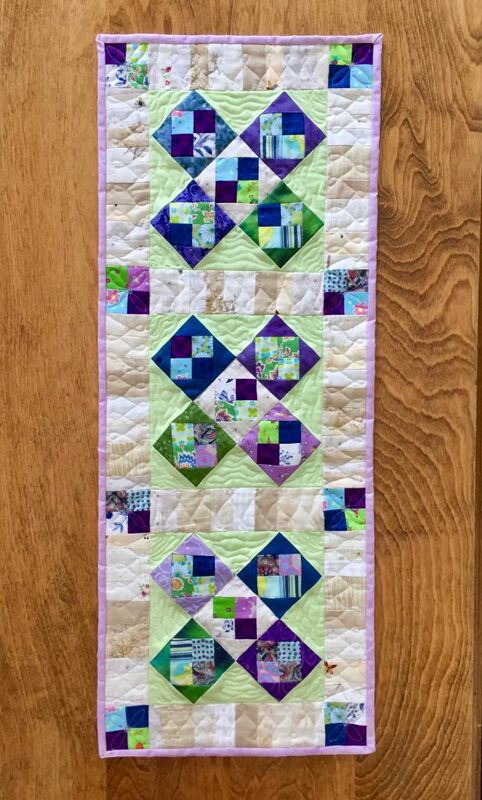 Hi Bernie, I’m just finishing my first truly scrappy quilt, it is Good Fortune, the Mystery Quilt Bonnie Hunter presented in 2018! I’m loving it and I’m no longer stymied by what goes with what! i.5 inches is about my limit for scraps at this point, but who knows where this path will lead me! I love the ideaof smaller projects instead of a full quilt! i am doing one of bonnie’s leaders and enders projects from scraps and trying to keep up with my scraps with her scrap savers technique. I love the idea of this book and I love your tablerunner/wall hanging. I tend to save scraps and then cut them into strips or squares for use later. Pieces under an inch are a bit of a stretch for me but anything larger is doable. I think scrappy quilts are such fun and a good way to use up fabrics that I’m not so fond of anymore. Scrappy quilts remind me of the “make do” of the people who went through the Depression. The smallest I’ve used is 3/4″ strips to make log cabin blocks for doll quilts and placemats. Great fabric choices on your mini-quilt. I have found contrast is the most important part of fabric selection so that Bonnie’s scrappy quilts have structure. Hope I’m lucky enough to win Bonnie’s most recent book.. I love scrappy quilts and make a lot of them. I love anything that Bonnie Hunter does. 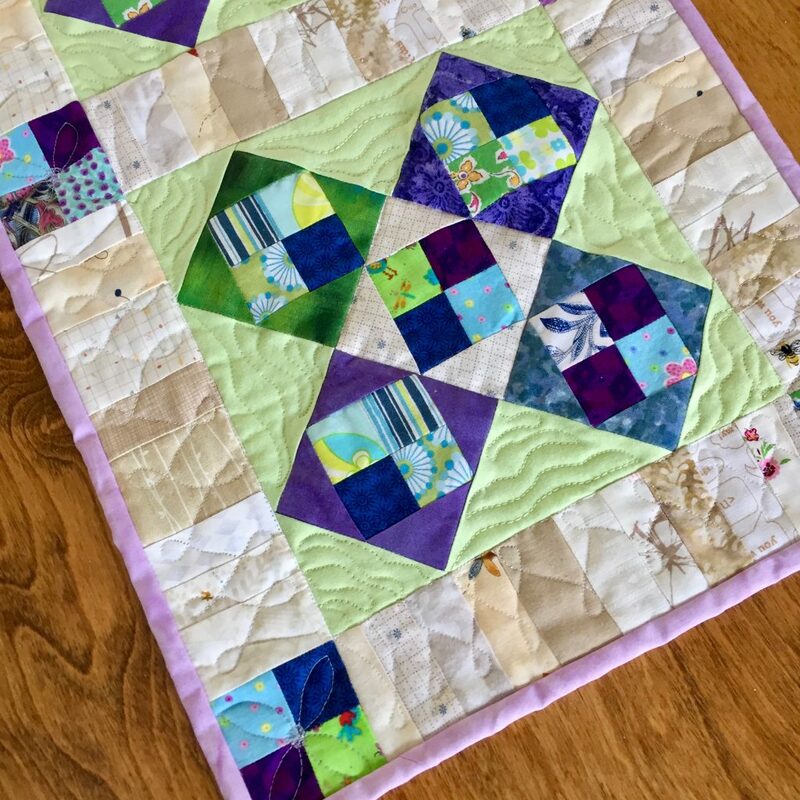 love what you did with bonnie’s pattern…as a hand quilter most of her quilts have way too many seams, but making a few blocks into a runner or wall quilt is just as satisfying and inspiring….thanks for the idea! I am a scrappy quilter who loves selvage and strings. One inch strings are the smallest I save. No scrap tooo small not to use, Mine are in colors in small boxes, tiny trims and left-overs to use for minis or paper-pieced projects. Luv your greens & purples together looks like spring crocus blooming. thanks for energies. As I make more quilts, I have more scraps. Scrap quilts are on my radar. I did do one of Bonnie’s mysteries and am assembling a second. I do sew with scraps. I will keep strips that are 1.5″ wide, but not squares. I don’t keep the “little scrimpling” pieces unless I’m working on a small paper piecing project. Love the varied pale background in your table runner. Definitely have gone to the scrappy side, even though I do say I’m selective about the colors/fabrics that are used in each project. I save even small crumbs at 1” as I’m making crumb blocks with no thought to the aforementioned selective fabric selection and sometimes that 1” is what’s needed to get the block up to the desired size. I love scraps and especially love other people’s scraps. I am known at my guild as the “crazy stringer” and am often given bags of leftover string scraps. Such fun to dig thru them and make string quilts. What a great post Bernie! Oh yeah, I have lots of scraps. This post and the new book makes me want to revisit my scrap bags and see what I can come up with. I save all my bits. Maybe someday I will use them. No I hadn’t been saving 1.5” scraps, but this year I have. I’ve made a few of Bonnie’s mystery quilts. I’m working on the scrappy Hunter’s Star now. In red and white. I need more hours in the day! Love the runner. And, yes, I save anything bigger than 1/2 inch. I use Bonnie Hunter’s scrap saver system. Anything smaller than 1.5 inches goes into a swing-top trash can by the cutting table. When it fills, it gets dumped into a huge overflowing tub. The tub has come into play twice since Christmas for string quilts. I love scrappy…and Bonnie! My scrap bins don’t seem to be emptying though, and I have made at least 8 of Bonnie’s quilts. I save crumbs, but have not used them yet. Too many inspirations, too little time. I love scraps. My current project uses selected strips I cut from every fabric I purchase. Love your wall hanging. What a great idea. Love the runner, Bernie! I’d hang it. You can always use it as a runner too, even if you hang it first. I think it would make you grin each time you come into the room! I like scrappy quilts but all those tiny pieces intimidate me. I have started a couple of Bonnie Hunter’s quilts but have not yet finished one. Not really a scrappy quilter. I have started cutting fabric up into usable bits as every time I go to my scraps there is just not the right thing. That being said, I love the looks of quilts that are scrappy. There are very few kinds of small pieces I save now….probably the result of downsizing. I love scraps. The smallest I have pieced is 3/4″. It was tight but a challenge. I love scrap quilting, especially string quilting with my scraps. I am also a Bonnie follower and have been for years. Your Daybreak is gorgeous. I’ve been known to cut/use 1″ squares! I love anything scrappy. I love using scraps! I have made Bonnie’s spider quilt and basket weave quilt using Christmas fabrics. I save just about every scrap of fabric over 1″ for crumb quilts. HI Bernie, I love your table runner. I am a certifiable scrapaholic. I would rather play in scraps than buy new fabric and since all my friends give me their scraps I’m a happy scrappy quilter. Your table runner/wall hanging is just a perfect way to use scraps! I do keep little pieces because I want to do more crumb blocks. They are so fun and add so much interest to a “plain” quilt. Thanks for the chance to win Bonnie’s book. Sew on!! Like you, Bernie, I enjoy Bonnie’s scrap patterns with a little bit of color limitations. I have finished two tops of her designs and took a class of hers in the summer of 2017. My finished tops are one of her mystery quilts and from class. I started to hand quilt the first one and maybe someday it will be finished. The second is ready for me to take to the shop where I can rent longarm time. I use Bonnie’s system of scrap organization – even the 1 1/2″ squares (postage stamp quilt some day?) Like everyone else, I am trying to use fabric from my “collection” (sounds so much better than stash) as much as possible. I have been reading your blog for a few months now, and I enjoy it very much. Thanks! I have not made a scrappy quilt yet. I don’t think I’d have enough scraps. I do use what I have for applique. I love what you made. The colors are wonderful. I love making scrap quilts, sometimes with a color plan and sometimes anything goes! Scrap quilts are my favorite. I particularly enjoy Bonnie’s patterns where anything goes, fabulous way to clear out the “what was I thinking” fabrics and come out with something wonderful. I love Bonnie’s quilts and have made several. My scraps continue to grow and I need new fresh ideas to use them up. This book would do the trick! I love scrappy over everything else! I will save 1 inch or larger. I have done a couple of Bonnie’s patterns. Your table runner is adorable! Blog hops are fun – you get to see so much of the book and be thoroughly drawn in. Bonnie Hunter’s style is amazing, isn’t it! Yes, I scrap quilt and no matter how I toil away, my piles don’t seem to diminish much, but I sure do like doing it. I save pretty small pieces – maybe 1.25″ x 1.25″? – tho I am trying to let go of them more as my mountains grow. Would love to win this, natch!! Love the string quilts I have seen so far, and really want to make one. I admire Bonnie’s quilts, even though I haven’t made one yet. I even bought the fabric for one, but something came up. I have made other scrappy quilts, and also use saved scraps for applique. I love the look of scrappy quilts! I’m currently working on 2 quilts for our recently purchased lake home and planning on putting the quilts in the granddaughters bedroom. Bonnie has inspired me to save my scraps and hopefully I’ll have something to work with when the quilts are done. Bonnie’s book would be a great inspiration for me. Thanks! I am a scrappy quilter. I have tubs of Bonnie Hunters scrap saver system 1.5 and larger. I also have a HUGE basket of strings plus a color tub for larger pieces I didn’t want to cut into specific sizes. Love your scrappy controlled table runner! I am a scrappy quilter and have adopted Bonnie’s scrap saver system. I had to stop sewing recently to get the scraps rounded up and corralled. Now to get to the next scrappy. Yes, I like to make scrap quilts, St. Louis 16 Patch is my favorite so far. I have not done any string quilts yet, but I plan to. My leader/ender right now is the four patches for Bonnie’s Bricks and Stepping Stones. I enjoyed your review of Bonnie’s book & the idea of using a limited palette of colors. I may try that. Yes, I am a scrappy quilter..most of my quilts are Bonnie patterns. Only things that go to dog beds are scraps less than 3/4 of an inch. Yes, I am a scrap quilter. I’ve taken several of Bonnie’s classes and have all of her books but this last one. I just dug out an Irish chain that I started years ago that the squares are 1 inch finished. But otherwise I’ve been cutting alot of 1.75 for a hexagon quilt. Take care and thanks. Robert, from northern Iowa. I follow Bonnie all the time and have purchased several of her books. So far I’ve only made Bricks and Stepping Stones. I recently organized my scraps into strip sizes. I’m always dreaming of quilts I’s like to make soon. Love your colors as well as the smaller project. Much easier to finish! My quilts are often a controlled Scrappy color scheme similar to your table runner rather than the 3 to 6 Fabrics that my beginning quilts were. I hope to one day make Bonnie Hunter’s paper pieced pattern so I save all my scrapes. I am a happy scrappy quilter. It’s an addiction I believe. I blame it all on Bonnie. I stick to mainly 2” or bigger scraps but the smaller ones are “soooo” cute may have to give it a try. Love your project! May have to start small with small. I’ve gone from disliking scrappy quilts to loving them. I had to get over the “horror” of mixing all colors and prints, etc. to combining lots of different fabrics. I’ve done several of Bonnie’s mysteries and love her definition of “neutrals”. I do save almost everything and use the tiniest pieces to make crumb blocks. I also have a lot of triangle cutoffs that I either need to use or just get rid of. Thanks for being part of the String Frenzy blog hop. I am sometimes a scrappy quilter. I usually make 2 1/2 in. strips and 2 1/2 in. squares in my clear plastic bins for scrappy quilts, even some from bonnie hunter’s other patterns. Yep…I am a scrappy quilter, among other quilty approaches. Bonnie Hunter is my scrap-guru. I enjoy taking gifted fabrics or a specialty fabric and turning it into a scrappy fun adventure. I do scrappy since finding Bonnie Hunter, but saved scraps since I started quilting–after all, it’s fabric and I paid for it!! I save everything from strings at 1/2 inch wide to 1 1/2 inch squares. I have made quite a few of Bonnie’s patterns and have four in various stages. Two started life as leaders and enders. Hello Bernie.. love, love, love your table runner/wall hanging. I just love Bonnie’s patterns and have been collecting fabrics and have several in various stages. Some are just going to be wall hangings/throw size because I wish to try so many of her designs that I can not possibly make them all. bonnie hunter is the scrapquilt queen! I love making scrap quilts and have done a few of Bonnie’s mysteries. Love scrappy quilts and have made several, mostly Bonnie’s patterns. Save almost every scrap. I adore scrappy quilts and have made 3 so far. 2 of Bonnie’s patterns which are so fun to do. Finishing a Carolina Chain and looking for my next project!!! Thank you for this giveaway!! Scrappy foundation quilt as you go (my version) is my favorite quilt to make. I just finished one and the only fabric I needed to purchase was a yard of black to set off the blocks. Even the batting, backing and binding were from my scraps. 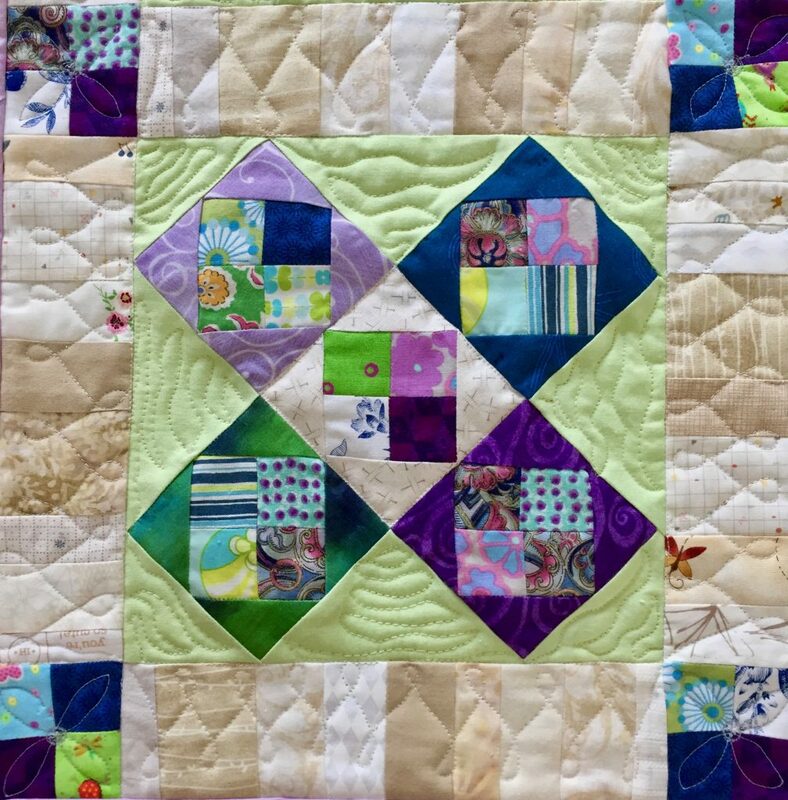 When I do a foundation quilt as you go I use scrap bating as my foundation and do decorative stitching in each block which takes the place of hand quilting. I then sew my blocks together the normal way but use a little over a 1/4″ seam allowance to reduce the batting bulk. For the backing on this particular quilt I used a no longer needed flannel sheet and backed it the normal way then added my binding. I have never received so many compliments on a quilt before mainly because it was so colorful. I love Bonnie Hunter and all off her scrappy quilts. She has changed the way I look at fabrics, especially about light fabrics with a colourful print. Is it neutral or is it green/blue/red? Still ugly? Cut it smaller! I have made a scrappy quilt (top, not yet quilted) and another one is in the making. And yes, I do save 1,5inch squares. I am a BIG Bonnie Hunter fan! I absolutely love scrap quilting. I especially love ones made with 4 patches, half square triangle and of course strings. I love to use my treadles for the strings. I quilt them all because I feel like it calms me and soothes my soul. Some quilts are for my home- others are for my kids and as gifts.. I totally go all scrappy with multi color. I only follow certain color ways if that is what the pattern calls for. I quilt/ piece no matter the time or day. I volunteer for Victoria’s Quilt in my area and we donate quilts to cancer patients for free. I save some of the scraps used to make our quilts and use them regularly making more quilts for VQ.. I use everything from 1 1/2″ and up. sometimes smaller when making crumb quilt. Love quilting and scraps. I love to do scrap quilts and just finished a simple quilt that I made with some vintage 30’s and 40’s fabrics I found a few years ago. I made half square triangles using white as the other half, and put it together alternating HST blocks and various white blocks. Love how it came together even tho very simple. I’ve done 2 Bonnie Hunter mysteries and have a couple of very colorful and scrappy quilts from those projects. Your scrappy runner is beautiful! Yes, I do save and use my scraps. I love scrappy quilts and really enjoy making them. I cut my scraps into usable pieces as soon as I finish a project. My scraps range from 1 1/2 to 4 1/2 inches Then there are my strings. Larger sizes are separated for other projects. Thank you so much for the chance. I love scrappy quilts! We make scrappy kind of quilts in my church’s quilting ministry because all of our fabric is donated to us. There’s something comforting and homey about seeing a scrappy quilt. Oh yes, I am a scrappy quilter and a Bonnie Hunter fan. Have been known to dumpster dive at a quilt workshop to rescue those precious scraps that others threw away! 1.25 ” definitely worth saving! I use my scraps a lot as leaders and enders, making four and nine patches, and then eventually figure out something fun to do with them. I need to do the few color palette to keep my. Quilting more organized looking. Thsnks for the info. Love Bonnie quilts! I’m an addicted scrappy quilter…working on Garlic Knots right now. Love Daybreak, so would be super happy to win a copy! I love scrap quilting. I have made several of Bonnie’s quilts including the last four mystery quilt. I discovered Bonnie about 4 years ago and have now made 3 of her mysteries and 3 other patterns. I really LOVE scrappy ow! I used to think 1 1/2 was too small, but no longer! Thanks for having a part in the blog tour for String Frenzy! I am feverishly trying to use up my scraps! At the moment I am making a piano key border to finish a quilt (this one’s for me!) I started 2 years ago. It’s all such fun though! Would love Bonnie’s book as i read her blog daily! I’ve just started following Bonnie and I’m making the current mystery quilt. I really like her work and would love to read her book and make some more of her quilts. I will save and use anything at least half an inch and after seam allowance sometimes only 1/8 inch shows! Just made a crumb quilt with multiple crumbs in a 1.5×3 inch rectangles. Need to get that quilted for a show next month! I discovered Bonnie Hunter’s frenzy for scraps shortly after the new year. I am on my second scrap quilt and am delighted to see even the little pieces I couldn’t bear to throw away being put to use. Actually I’m on my third. I’m looking at a quilt on my design wall that I made using one of Bonnie’s quilt blocks only made them three times as big so it doesn’t look like a scrappy but it is. I’d love to receive the String Frenzy book. I still haven’t reached the bottom of the bin! Thank you! Your hanging runner is awesome! I’d put it on the wall, too! I collect my scraps, and have made a string quilt from the blues bin! Thank you for the giveaway! I love all things scrappy! I even had an opportunity to take a class with Bonnie Hunter! Such fun! I’ve visited your blog many times and really enjoy it. Thanks for the chance to win! I’m a Bonniac and scrappy quilter for sure! I am totally a devoted to Bonnie Hunter and scrap quilting, but I didn’t realize it until about ten years after I started quilting, when Bonnie started publishing her column Addicted to Scraps in Quiltmaker magazine. I have made a BH Twin Sisters block quilt and Hopscotch Butterscotch quilt and I am working on a Rick Rack Nines quilt. I have adopted her Scrap Users system and always have a leader and ended at my sewing machine. I can’t wait until the Quiltville retreat center opens! I am a scrap quilter. My closet is full of scraps and maybe someday I’ll get to use them all!!! I’m not usually a scrap quilter, in part because I’ve only been quilting less than 6 years, but I did make some “scraps” to use to make Bonnie’s On Ringo Lake. Yes I am a scrappy quilter. Sometimes its a controlled scrappy and other times it’s everything but the kitchen sink. Depends on the pattern. I live for scraps!!! Love them. Hi Bernie, yes I am definitely a scrappy quilter, and I save, and use scraps down to 3/4”. Since Bonnie is no longer posting orders overseas I would LOVE to win a copy of her new book. I might be considered a Bonnieholic. I cut my teeth on her Mystery quilt 5 years ago…my first full quilt. I didn’t even know what a point was non the less that you are suppose to protect them. In the last 5 years the only thing I have made is scrap quilts and love everything Bonnie. A scrap too small would be double and triple checked to eliminate any possibility of usage—crazy when you think I would have to live to 150 years old to use up my stash … such is a scrappy Bonnieholic. I have followed Bonnie for a long time now! Most of my scraps are organized by her Scrap User System. I still have a pile that needs to be worked on – that’s for sure! That sure makes a project so easy when I need to do a guild block or project on a short time table! I save anything more than 1″ square, as I love doing crumb blocks. So glad to ready your blog today! I like the controlled scrappy quilts right now, but this years Mystery Quilt, Good Fortune was beautiful with all its scrappiness. Yes, I do save even small scraps, but maybe just a little larger that the 1 1/2″ ones. Love Bonnie’s indepth instructions, and the ease to make what seems like a difficult quilt when going step by step her way. Have a couple of Bonnie’s books but, haven’t tackled my scrap pile yet…have to sort them out and start the process. Trying to choose a pattern. After eying my piles of scrap and wondering how to organize them, my friend Carol (who has taken a few classes with Bonnie) turned me on to Bonnie’s work and scrap theory. So, I scoped out Quiltville and her blog and I am now organizing per Bonnie. My silk /velvet scraps go into my crazy quits and I use cotton scraps for appliqué. But I know I have enough for a quilt or two, and Bonnie has some very inspiring quilts. So, back to sewing and cutting. I enjoyed your site and will have to sign up. Gotta go and help some friends make a quilt for another’s wedding. More scraps!!! 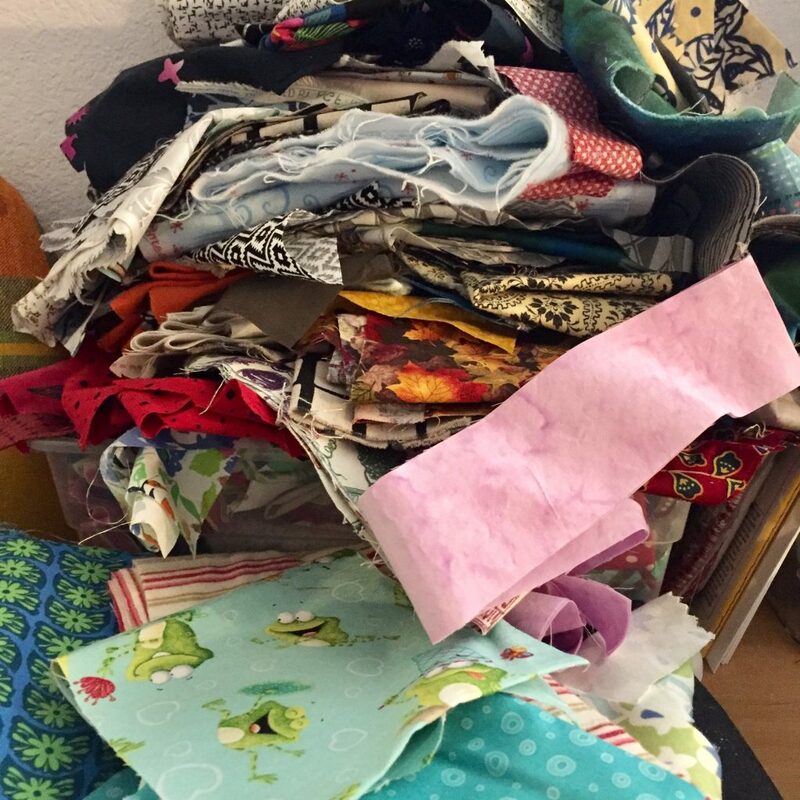 I am not a scrappy quilter, but I want to be…have a huge pile of scraps. 1.5 is TOO small ☺ I only save 2.5 inches or larger. Hi Bernie, Yes, I am a scrapper. I have followed Bonnie for years and was a scrap quilter even before that and even more so since. I’ve made several Bonnie quilts and almost all of her mysteries, mostly all from scraps. I really like the table runner you made. Love these itty, bitty blocks. I save everything! Tiny dog ears go in a jar for later fusing on art quilts, skinny strings go in a box for making coiled rope bowls, and everything else goes in a pile for crumb blocks. Thanks for our inspiring post! I do scrappy! At least for the last 20 years or so. 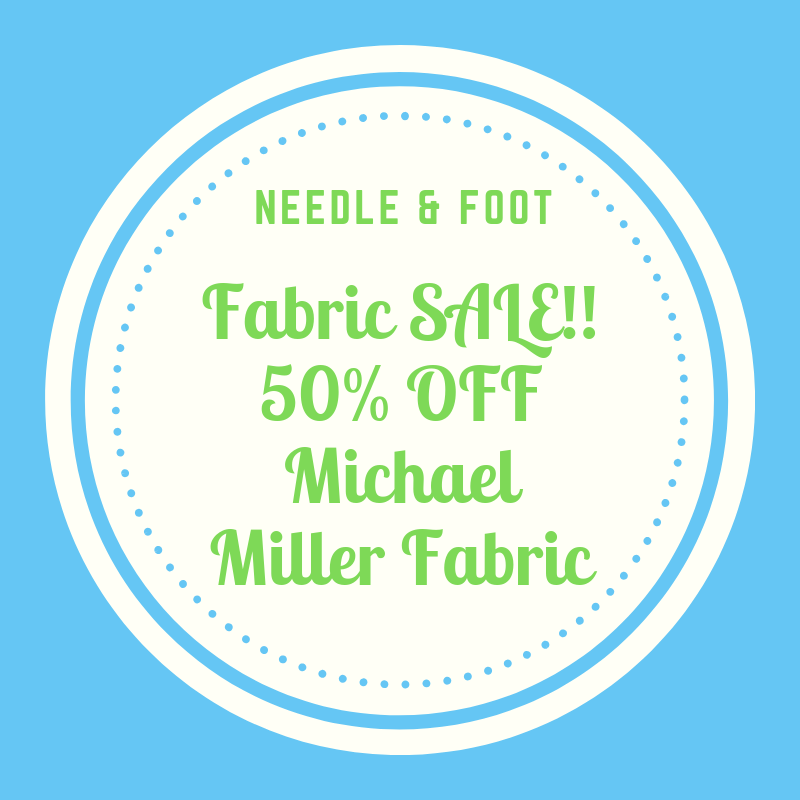 Will occasionally buy yardage for backing or sashing but have not purchased new fabric for piecing in that length of time. I’m 74 now and decided years ago to start using my stash so my husband wouldn’t have to worry about it later. I give my small scraps to a friend who has followed Bonnie for many years. I’ll keep larger pieces (8X10 or so) for my projects – usually charity quilts for Linus Connection or for soldiers/vets or for my church projects. I don’t have any of Bonnie’s books so would really like to win her new one and learn some of her tricks. I really need to get more efficient so I can make a dent in that stash. I do love scrappy quilts! I have yet to make a “totally scrappy” quilt, but I adore them!! I save almost all scraps. I notice the more I love a particular fabric the smaller the piece I’ll save! I guess I make controlled scrappy quilts. I pick a few colors – pull out what I have and try to make something up. It always seems I have strips when I should have squares – guess I need to reread Bonnie’s suggestions for cutting things up! Thanks for the chance. I like scrappy quilts. I am in the middle of a string quilt right now and scraps are everywhere. I LOVE scrappy quilts….and I love Bonnie Hunter’s patterns! Loved your spin on a ‘controlled’ scrappy table runner! I have lots of scraps but have not made a scrappy quilt. I save almost all scraps over an inch or so. Love your project. I love scrappy quilts. 1.5 is pretty small for me to save I go for 2 and bigger. Usually I make string quilts for donation. Love the color choice! I am in the midst of using up scraps using Bonnie’s books, of course! yes, i save every scrap i have, even little tiny ones that i can [and do] use for applique, a birds beak etc.! and i make all kinds of scrapy quilts!!! I love making scrappy quilts and yes I keep 1.5″ squares and even smaller to cut triangles! I love your table runner. Scrappy quilts are my favorite. I love scrap quilts and have made a number of them. 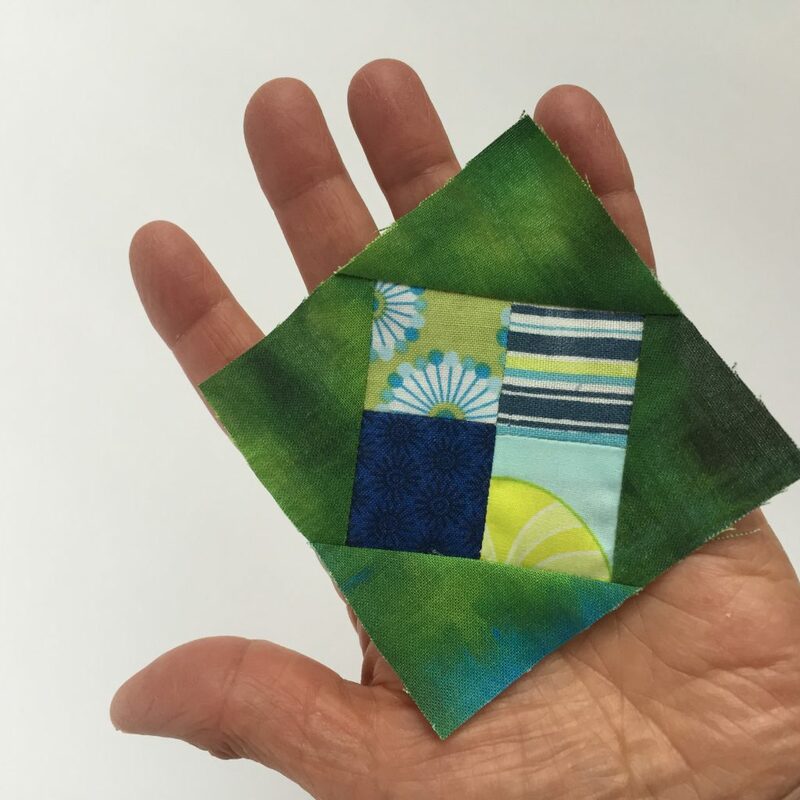 Nothing is too small…….then again, anything smaller than 0.5″ might be too small, but I recently completed a queen size quilt made from 1.5″ squares. I LOVE It. Currently I’m busy with a crumb quilt, so the small pieces are coming in very handy. I quilt for Project Linus and many of our donations are scraps. The answer at our chapter is give it to Kathy, she will use it up. Most of my children’s quilts are a combo of scrappy blocks and children’s prints. At the moment, I think I have more scraps than actual yardage! I have been using my scraps to make quilts for my kids. 1″ is the smallest I will keep. I really enjoyed the way you took what Bonnie designed and really made it your own. I’m not a beginner quilt maker, but I still haven’t done one of her scrappy quilts yet, but it’s on my list! I have a bin of 2 inch squares and a bin of 1 1/2 x 6 1/2 rectangles. I have a plan for the rectangles, but I’m still looking for a project for the squares. Maybe there’s an idea in the String Frenzy book that will be perfect! I have enough scraps (even some organized by strip size) to be a scrappy quilter, but it just hasn’t happened yet. I completed my first Bonnie Hunter Mystery Quilt this year and this was my first experience with scrappy quilting and string piecing. I had a blast with this new experience! Not sure what my next scrappy experience will be but I will be giving it another shot. Pretty runner! I am fairly new to scrappy quilting. I seem to like control, but I’m warming to scraps as I seem to have so many. I recently recused several bags of scraps from our QOV group and have begun a scrappy QOV. It is taking awhile to get in the flow, but love the look of all these fabrics as they come together. While I like the look of Bonnie’s quilts I have not made a scrappy quilt per se. I have accumulated a variety of coordinating fabric that I have used to make similar scrappyish quilts for three granddaughters. I also have a lot of novelty fabric I use for “I spy” quilts. I am a scrap saver and do save even the small pieces. Thank you for sharing your quilt. After seeing what you have done I am encouraged to start small and make a controlled scrappy quilt. Maybe after a few of those I will be able to throw caution to the wind and make a true scrappy quilt. Love this table runner! I love to make scrappy quilts and have learned that I like “controlled” scrappyness the best. It feels so good to dive into my scrap bags and produce a quilt without having to buy additional fabric!! Yes, I’ve made a few scrappy quilts before. I don’t keep really small scraps, but I do have scrap baskets that are overflowing. Bonnie’s patterns are great! I love the way your project finished. In the donated fabric at church one day, I found a box of 2 inch squares. I made 4 patches and alternated with a neutral. One of the ladies liked it so much she bought it for her granddaughter’s graduation. The girl was thrilled. Since then I have been saving the smaller scraps with the thought of making another one. But those scraps just seem to sit there. I finely have decided that I need to cut to size as I accumulate. I found Bonnie’s blog last fall and now have started some string blocks. I have been known to raid the trash can at the Extension Homemakers sewing day. Some people just do not know what they are throwing away! The 1st quilt I made was a scrappy American Flag wall hanging. It got me interested in quilting. I don’t make a lot of scrappy quilts, but my favorite is a dresden plate quilt I mad for my husband. I keep most scraps, but the size depends on my mood. I love your table runner and your idea of doing smaller projects for the feeling of getting something done. Yes, I save scraps and use them when I can. I haven’t been quilting very long so don’t have a large stash yet. I like the way you used your scraps in more of a theme to make that lovely runner/wall hanging! And thanks for sharing how you quilts it as well. Scrap management quilts should be a high priority on my list right now! I like making the crumb blocks on foundations and setting them into a square on point. They are really pretty in color families. But truth be told, I save everything….even strings because they go into little pin cushions as stuffings. The pin cushions are fun little gifts to sewers or children. Love your color choice for your table runner/wall hanging..My small string/ scrappy projects seem to be pot holders..lol Fun to make and always a supply for an unexpected gift. I love the table runner! I am a huge scrap collector. If it is smaller than 1 1/2 inch in width, it goes into a bag for a friend who makes beds for shelter pets. Anything larger is kept, which is comes in very handy for tiny blocks! Love, love, love scraps! I’ve done many scrap quilts over the last six years since I retired. Yes, I am a Bonnie Hunter fan: took a workshop with her this year. Thanks for the giveaway! Sure hope I win! Yes, I always have a scrappy project going, and I will save 1.5″ squares. Thanks for the opportunity to win. Sometimes I do string piecing other times crazy patch work. Use alot to make small bags and other items. . 2 in. pieces are about my limit. Oh, am I a scrappy quilter? I can hardly cut up my yardage because I have bins and containers of scraps!! I’d love Bonnie’s new book to help me use some of them, although I know they have a tendency to multiply like rabbits! Scrappy is my favorite! I save down to 1 1/2″ and I try to stay organized. I do like your controlled scrappy take on your lovely table runner! I really like the idea of scrap quilts and I certainly have no shortage of scraps. I also really like Bonnie Hunters patterns. I would love to win this book, thanks for the opportunity! I love scraps! I usually save 1 1/2″ squares and 3/4″ strips on up. I just found a pincushion pattern I love and it call for 1 1/8″ squares!!!! Currently working on Bonnie’s “Hunter String Star” pattern. I am just getting into Bonnie’s “neutrals”–that was hard for me at first! LOL. Thanks for the chance to win. I have recently read the first two years of Bonnie’s blog. I only collected scraps before that. She shows just what you can get of those cast offs. I am currently working on several BOMs and using only what I have on hand. Before Bonnie I would not have saved a 1 1/2″ square. Controlled scrappy is the way I prefer but with strings anything goes. I make lots of scrappy projects! I love scrappy quilts and Bonnie Hunter is my favorite. I always thought her quilts were too difficult for me. A friend talked me into making the On Ringo Lake and I struggled with it but finally finished it. This years Good Fortune was so much easier for me once I had the hang of Bonnie’s methods. No piece of fabric is too small for me. I save everything! Thanks for the opportunity to win. Love your runner! I love Bonnie’s blog and her designs. Thanks to here mentioning this blog, I am now signed up to receive email whenever you make a post. 😎 I have enjoyed reading back to older posts here. Thanks. Every time I do something quilty it’s scrappy. I do save pieces as small as 1.5” from my quilt group. I save is 1 inch. Perfect for string quilting. 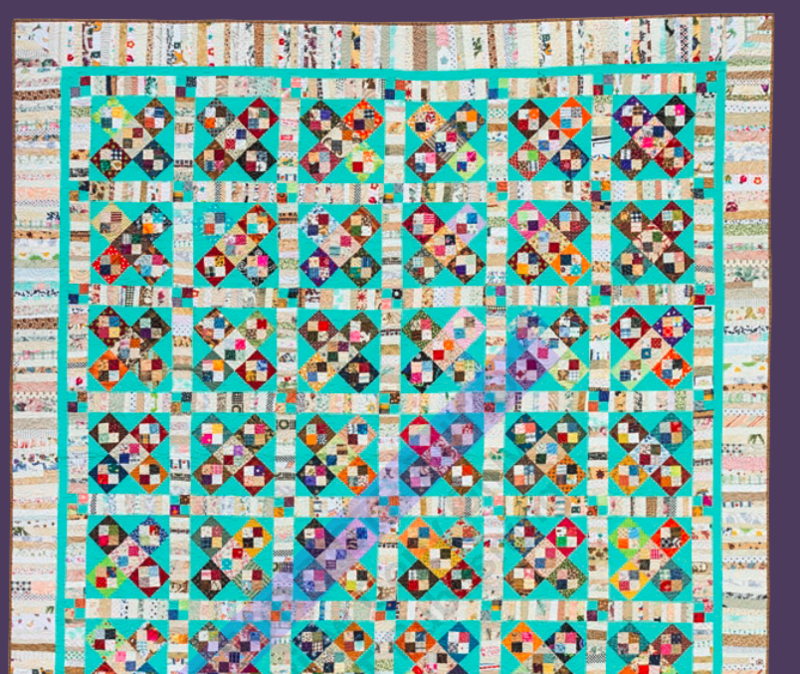 I have made several of Bonnie Hunters quilt patterns and would just love her new book! Anything over 1 1/2” square is a keeper! I love making scrappy quilts and I make lots of them. Bonnie Hunter’s scrap quilts are amazing and this looks like a great book. As for saving scraps, I save almost everything just in case I might need it. It’s a problem. I have been making scrap quilts for years now and I never seem to run out of scraps. I keep anything 1″ and larger. I love Bonnie’s quilts and following all the adventures. It has been great to learn about and appreciate all the scraps and things to do with them. Organizing the ‘stash’ is one of the best. Even the really unusable scraps of thread/yarn cuttings (any textile) go into a pillowcase to make a critter cushion ~usually for a dog or cat. The first Bonnie scrap quilt I ever made was this year during the Mystery Quilt “Good Fortune”. I love making it and knew right then there would be more scrap quilts in my future. So much fun to make. The smallest scrap I save is around 1″ I would say. I love scrappy quilts and I confess to having a bin dedicated to small scraps for a future crumb quilt! About 1 inch is the smallest I save, however. I’m currently working on a scrappy 9-patch using 1.25 inch squares. They are addictive! I adore scrappy quilts and make many of them. I will save anything the is 2″ or larger. My mother-in-law and I use all our scraps. I love scrappy quilts-have made 1 and saving everything 2 inches and more for the many more I hope to do. Bonnie’s quilts are the ultimate scrappy!! Hi Bernie, I have been following Bonnie for many years, have made numerous mystery quilts with her, had the wonderful opportunity to be at a retreat with her and be in her workshop. I have almost all of her books. Because of her I fell in love with scrappy quilts. I have always saved my scraps down to the smallest pieces. I love scrappy. I’ve made 3 of Bonnie’s quilts so far and have 2 in progress. The smallest pieces I save are 1.5″ square, but recently I purchased a paper piecing pattern that uses tiny little scraps, so I might start saving smaller. Thanks for the giveaway. Hello, I do like scrappy quilts, always have. I didn’t want to waste fabric. I have a king size quilt from a pattern that is free on line called Mile a Minute. I love scrappy! I’ve been making I Spy crumb blocks to make a quilt for the new baby in our family! I absolutely LOVE making scrap quilts using pieces from my scrap bins and loving donations from my quilty friends! The smallest scrap I’ll save is 1.5″ squares. Lately I’ve been enjoying all the string QALs going on in many internet circles right now. I love scrappy quilts. I save everything at least an inch wide. I love how Bonnie incorporates string units in her quilt blocks. I never considered doing anything except a block made entirely of strings. The smallest scraps I save are 1 inch. I hate to waste any fabric. I have lately been making crazy quilt blocks with scraps from a group paper piecing project and my own scraps. I save all scraps and like making scrappy projects. I follow Bonnie on a daily basis, have taken workshops from her, here in Alaska. I hope to go with her to Ireland next spring, also. Where about in Northern Sierras are you located? I was stationed in California for 20 years, and have lived all over it. I love your table runner, and I do not save scraps smaller than 2 inch strips. Anything smaller, I save and give to friends! I made my first scrappy quilt this year with Bonnie’s Good Fortune mystery quilt pattern. I am saving my 1.5″ scraps to make Crab Apples pattern. I am relatively new to quilting and have not made any scrappy quilts yet but I have kept all my scraps to make one someday. I love how the fabrics all blend together and look like a cohesive unit when finished. Scrappy quilting is my absolute favorite – I have over 30 of the stacked plastic bins FULL of scraps, all sorted by size, which makes it both easy & fun when I want to make another scrappy quilt. The sizes are from 1.5, 2, 2.5, 3.5, 5 and 10 inch scraps, and yes, I save the 1.5 squares as well. I’ve got fabrics from the 30’s up to current times, and have made many scrappy and I-Spy quilts for adults & kids/babies. My favorite projects are table runners, mug rugs, and especially quilts, from baby size up to 126″ square quilts for our bed. Thanks for the chance to win Bonnie Hunters book! continue to see what your doing! I adore scrappy quilts. I love making and gifting them. For kids, I think they are some of the best quilts to give… the quilt can entertain them. I save anything bigger than an inch, in big tubs scattered thru-out my sewing room. I read about Bonnie’s scrap system soon after I began quilting about 5 years ago and have accumulated many strips and squares since then. I even save 1” strips! I have always loved scrappy quilts and especially Bonnie’s! I love the fact that you made the scrappy table runner. I always think I have to do a BIG quilt. I used to only save 2 1/2″ pieces or bigger, but since following Bonnie, I have changed my thought process. While I haven’t made a lot of scrappy quilts, one of my favorites I’ve ever made was scrappy. I am not a true scrappy quilter most of the time but I am collecting a pile of scraps in my scrap box from my most recent projects. I have a couple of Bonnie’s books in my collection. Would love to make more of her quilts. Thanks for the chance to win her book. I love the look of scrappy quilts. Hi Bernie. I really enjoyed reading about your runner. It’s a sweet way to use those scraps, but then all of Bonnie’s patterns are. I love scrap quilting and usually try to trim my leftover bits using my Accuquilt cutter and dies in to useable squares, rectangles, strips and triangles which I store in pizza boxes. Once the box is full I have to use them. Right now I’m using the untrained scraps from my last 4 quilts to make crumb blocks. It’s an experiment for me! I have just gotten into making scrappy quilts. But I have to say, they are planned scrappy. Have not yet ventured out into totally scrappy. Yes I am a string quilter. Have made over 8 of Bonnie’s quilts. Thoroughly enjoy the process. String Frienzy is the only Bonnie book I am missing so would love to be the winner.